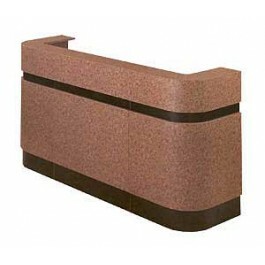 KAEMARK SYSTEM "A" DESK INCLUDES: 9040-3, 9040-R. 9040-L: LEFT HAND DESK MODULAR, laminate interior and exterior. Work top 30' high. 9040-3: 3 FT. DESK MODULAR, laminate interior and exterior. Work top 30" high. 9040-R: RIGHT HAND DESK MODULAR, laminate interior & exterior. Work top 30" high. 9040-2D 2 DRAWER ACCESSORY CABINET, w/2 non-locking file drawers on ball-bearing slides & w/white extruded PVC laminated finish. All exterior laminated. 9040-3D 3 DRAWER ACCESSORY CABINET w/top locking cash drawer, non-locking center utility drawer & bottom file drawer. All drawers w/ball-bearing slides & white extruded PVC laminated finish. All exterior laminated.